Formed as an Independent Volunteer Cavalry Company in 1859 from Fauquier County, Virginia of some of the finest sons of the "old Dominion," the "Black Horse Troop" was one of the first Confederate units on the field at First Manassas. Their reputation as horsemen and fighters was already so renowned that the cry "The Black Horse" spread panic in the Union ranks when J.E.B. Stuart's charge turned the tide of battle. Throughout the war the gallant riders of the "Black Horse" brought honor and glory to the Confederate Cavalry in the Army of Northern Virginia. Depicted is a First Lieutenant of this renowned Troop during the initial stages of the War. The Black Horse was mustered into state service in May of 1861 to later become Company H of the 4th VA Cavalry but kept their "nom de guerre" of "The Black Horse Troop." The uniform is early war cadet-grey trimmed in black, as many state militia and volunteer companies were. His arms consist of a "brace" of Colt Army .44's supplied, along with his Federal issue sabre belt, cap box (used for carrying spare pistol cartridges) overcoat, poncho and canteen by a ‘generous joe. The black ostrich plume is a classic statement of ‘Southern Chivalry.' The saddle is a Jenifer, popular in the South, and the bridle is a private purchase (or capture) combination halter/bridle with an imported English bit. The horse is his own, as all CS cavalrymen had to provide their own horse, and is of finer breeding than the Federal issue. 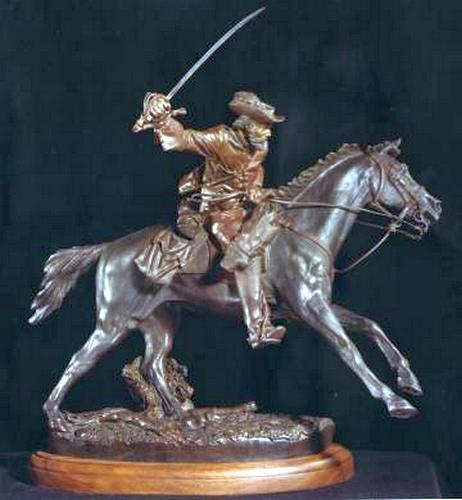 The sabre, a captured Federal Cavalry officers Model 1860, is being returned to comrades of its original owner.